Steven Combs - Got caught, did you? 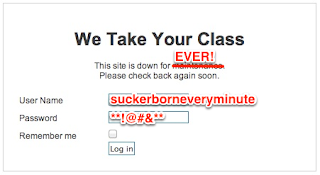 In case you are not familiar with the site, they promise, or rather promised, to “take” your online course for you and deliver an A at the end of the semester. All this for the low, low price of – an undisclosed fee. Learn my thoughts on this “endeavor” in this post. Higher Education makes it easy to cheat? Just how is the structure designed to facilitate cheating? I sure would like to have a better understanding of this theory since faculty worldwide are vigilant when it comes to maintaining academic integrity and rigor. Maybe Kevin can parlay this into a thesis or dissertation. My take on this whole situation is that We Take Your Class simply got caught and that is why they shut down. Kevin was probably (and again, this is purely conjecture on my part so enjoy my fictional tale) a student trying to capitalize on what he thought would be a high demand service. He wanted to be the next Mark Zuckerberg and was willing to sell his Web 2.0 soul to get there. And is Kevin really the site owner? He could be a disgruntled client? We don’t really know, so lets not be too hard on him. No, let’s since he was willing to become the spokesman for this very questionable site. I also can’t help but wonder if the site had clients. What student would actually use this service? Come to think of it, would any client really receive said service? If no services were rendered or even if they were unhappy with the service provided, where would they go? They would not be quick to litigate as that would result in an admission of their own guilt and lead to probable expulsion. Can you tell that I am very dubious with regard to this whole endeavor?